Tail biting is self inflicted biting causing noticeable damage to a Betta’s tail. Tail biting is not a disease and should not be confused with tail/fin rot. On occasion, ratty and mangled fins are the result of a Betta biting his own tail rather than outside causes. It is suspected that in most cases, the ragged fins are a result of poor water quality or injury from tank decor or other fish. Too often people believe their betta is biting his own fins when the problem is environmental but in some cases the damage is self-induced. The first step in getting to the bottom of your Bettas tale biting is to rule out factors such as poor water quality, sharp rocks, pointy plants, heavy filter suction or aggressive tankmates. I then recommend observing the fish closely to see if he can be caught in the act. 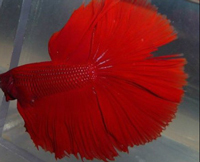 Why Do Betta Fish Bite Their Fins/Tails? The Betta being in a stressful situation. This happens regularly when Betta fish are shipped in dark containers for long periods of time. Boredom is believed to be a contributing factor. Heredity factors have thought to have some connection to tail biting. Change the decor in the aquarium. Hard decor can get easily caught on your Betta fish. Try adding silk or soft live plants instead. Attempt to move the tank to a new location. Decrease the lighting. Lighting in the tank can be related to Betta aggression. Keep your Betta occupied by adding a ‘Tankmate‘ (ensure you have a large enough aquarium). Add Pimafix, Bettafix or half strength Melafix to the tank to help regenerate fin growth. If your betta reacts to the medication negatively, discontinue use. Will My Betta’s Fin Grow Back? With proper care, your Bettas fins will grow back. It is important to intervene early to ensure the area does not become infected. Some suggest adding a mirror to the Bettas tank to allow them to relieve aggression against the mirror instead of their own fins.